The Fastest Woman in Canada! Dark Side Racing’s Kelly Fedorowich is on a mission that will propel her into the record books and lay claim to the title of Canada’s Only Licensed Female Top Fuel Pilot. In doing so, Kelly will also capture the title of Fastest Woman in Canada. This campaign will generate huge levels of brand awareness and provide unprecedented visibility and marketing exposure for sponsors. Dark Side Racing is in the business of motorsports entertainment marketing. 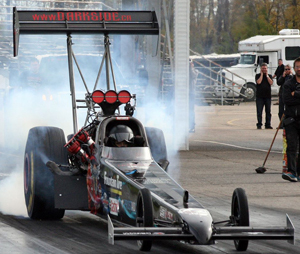 We connect sponsors with their target audience using our Top Fuel operation as our platform. Top Fuel Dragsters are considered the kings of the sport of drag racing. Dark Side Racing is a professional racing team available for competition, match races and exhibition races; we are a mobile entertainment company available to appear at fairs, festivals and displays. Dark Side Racing not only connects brands and consumers, we engage with our fans and make profound connections. Dark Side approaches sponsorships as true partnerships. We offer pre-packaged opportunities as well as the option to design customized packages to suit your marketing and brand objectives. Ultimately, we find opportunities where none existed before. Dark Side Racing has a communication plan to ensure that our sponsors reach their clients and prospects using Social media, a dedicated web-site, Facebook, Twitter, e-blast campaigns, promotion of our campaign at related shows, through media partners and through visibility on partner web sites.